Our homeschool visits offer a chance to climb and connect with other homeschooled students in the Triangle. 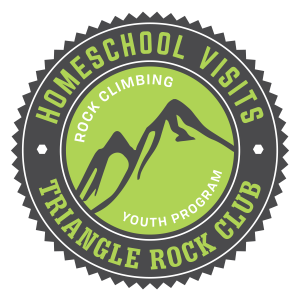 Each homeschool visit includes Triangle Rock Club event belayers that assist throughout your time at the facility to ensure each climber gets the most out of their climb time. Choose between one of our homeschool programs, or email Programs Manager Paul Klem at paul@trianglerockclub.com to set up a private visit with your homeschool group. Our One-Day Visits for homeschoolers operate once a month on a varying schedule. Harness and two hours of climbing time with our event belayers are included. Please pre-register to participate. If you love climbing with us and are interested in taking it to the next level, this class is for you! Students within a cohort will learn various knots, different climbing terrain and holds, basic climbing technique, equipment used to climb, and general knowledge of the sport of climbing! $40 deposit required at time of registration. The remaining balance should be paid at the first class. Take over our terrain from 10pm to 7am! At lock-ins, groups enjoy a night jam-packed with fun games, group activities, movies, and climbing. We’ll provide overnight staff to answer any questions and help with any requests or needs. At least two weeks’ notice is required for this popular Friday and Saturday night program. Email our Programs Manager at ingrid@trianglerockclub.com for more information.